If you follow me on Instagram (ladylouinrunners) you would know that at the end of August I decided to give myself a challenge and sign up for the 10km running event at the Melbourne Marathon. At the time I was running/walking 5km and I had just under 7 weeks to increase that distance to 10km. I also had 5 weeks off work, so I had plenty of time to run. My goal sounded easy, right? Well, no. For those 5 weeks that I had off work, Little K and I spent 3 weeks of it sick. And Melbourne's miserable weather was making it difficult to get outside and run as I don't have a rain cover for my running pram. And then, disaster struck! I got sick. Very sick. At first it started as a niggling cough one afternoon. By that evening I was feeling terrible. The next day I had aches and pains, along with a fever and fatigue. I thought I had the flu and would get over it but my cough was becoming worse. My lungs crackled with each breath. I went to the doctors and was diagnosed with a mild case of pneumonia in my left lung. Thankfully it was caught super early, therefore I did not need to go to hospital. I did have to take two courses of antibiotics, which were seriously the biggest tablets I have ever taken in my life! As I recovered I made a big decision to withdraw from my fun run. 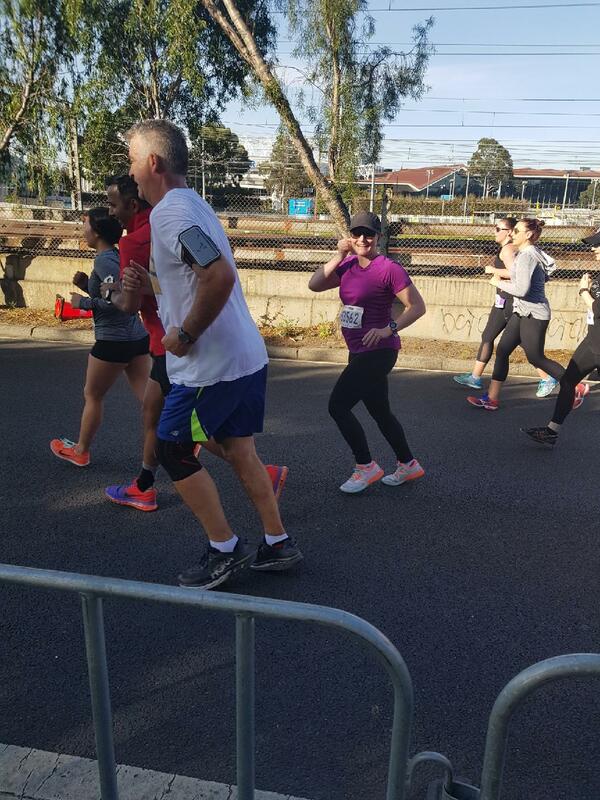 There was no way that I could be on my deathbed one day and then exactly 2 weeks later be running 10km. I had done some research on the internet which said it could take me months to get back into running after having pneumonia and that I would also have issues with fatigue. So I withdrew from the event. Or so I thought. On the Thursday before the event I went for a run and surprised myself that I could run 6km. My pneumonia appeared to have completely cleared up. Maybe I could run 10km? I also noticed that I never received a confirmation of my withdrawal and I kept receiving daily emails from the event organisers. The day before the event I went to the race expo to see if my race pack was available, which it was. To me it was a sign that it was time to run! On Saturday night I went to bed at 9:10pm, fell asleep straight away and bounced out of bed at 5:30am on Sunday. I was pumped to run. Getting ready in the morning was a little rushed as B and I were bringing Little K along to the run. The 10km race was due to start at 7:30am and I arrived at the start line at 7:20am - I have never been so late arriving to a fun run in my life. It felt really exciting to be back at a fun run after being absent for nearly two years. I was running by myself but I didn't care. I stuck my headphones in and listened to some tunes to get me pumped for the run. As I was waiting to start my run I noticed that some people had personalised t-shirts starting who they were running on behalf of. There was the usual sporting clubs, gyms and personal trainers. There was one in particular that really got to me. There was a man standing in a top that had a photo of a beautiful little girl called Isla. Her date of birth was on the shirt, along with a very recent date. This poor little girl, who was almost three years old, had lost her battle with a terminal illness. I had to try really hard to hold back the tears. Being a mother has made me really sensitive to these things. I spent some more time getting myself mentally prepared for the race. My goal was to stick to a pace of 7 minute kilometres, which would give me an overall time of 1 hour and 10 minutes. That sounded doable. It also allowed me the opportunity to squeeze in some short walks should I run a little faster at times. When my wave got called up to the start line I noticed that I was very close to the front. I had never been that close before. The buzzer went off and off we all went. It felt so nice to be running along with a group of people. Most of my time I run alone, which I don't mind, or with Little K in her pram, but it was nice to have company, even if we didn't talk to each other. I felt really good for the first couple of kilometres. My running form felt smooth, my breathing easy and I was in a good place. I also noticed that unlike a lot of other fun runs I wasn't having to dodge walkers and slow runners the entire time. I was able to focus on running. When I looked at my watch I saw that I was doing under 6 minute kilometres, which worried me as that was a little too fast for my liking. I was worried that I would burn out too fast. Eventually I encountered a slight incline, which helped me bring my speed down. At around the 4km mark I started to think about when I was going to take a walking break. I hate walking but I knew I would never be able to do the run without a few. 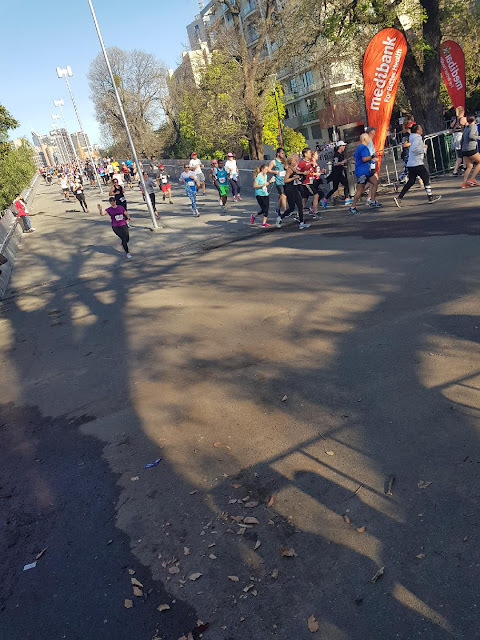 I was in a section where you run to a certain spot and loop back, so I was passing runners on the other side of the barrier who had been running further than me. I thought to myself that the section where we turned around must have been only a few hundred metres away. I kept running. And running. And running. I ended up running 6km before I needed to have my little walking break, which I was really proud of. Further on in the race we had to run up the William Barak Bridge, which felt more like a mountain rather than a bridge. 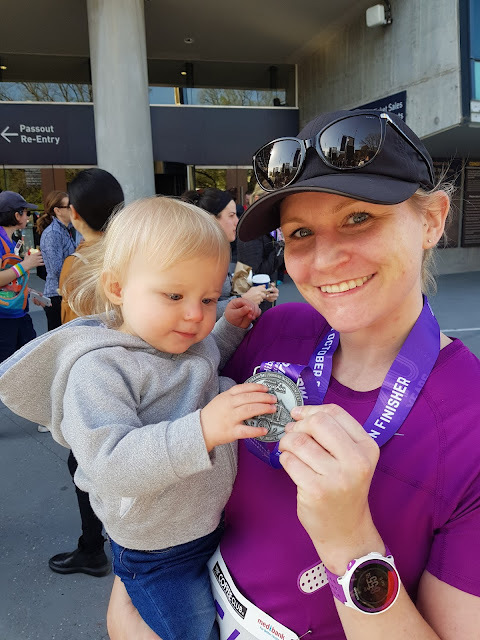 I knew at this stage that I may see B and Little K as we were in close proximity to the Melbourne Cricket Ground (MCG), which was where the race would be finishing. I decided to pick up my pace and as I did I spotted B holding Little K in front of me. It felt amazing seeing them, seeing B cheer me on and Little K look at everyone else except for me (yeah). I wanted to run right up to them so Little K could see me but I knew if I did I would stop and never be able to start again. I waved at them and off I ran. (Sorry for the poor photo - it was hard for B to take a photo and hold Little K at the same time). At this point I knew I was at the final stretch. I could see the entry to the MCG, although I would have to run past it to another point and then turn around. I was getting myself into the zone when I heard someone call my name. I looked over and there was B running along the barrier with Little K in his arms. I was so excited and I waved. I tried to make my way over to them but B got tired and stopped running. But it was so lovely to see them again as it was totally unexpected. Running into the MCG is amazing. You get a true understanding as to how big and powerful the ground is. You understand why so many cricketers, Australian and international, love this ground. You understand how footy players feel running on to the ground to play their favourite game. This ground was also used during the 1956 Olympic Games, which were held in Melbourne. I do have to admit that those final hundred metres running around the MCG were hard. My body had not run that distance, even with the walking breaks, for a long time. The last time I had run that distance would have been back in early 2014, when my body was battered and incredibly injured. As I was running I thought about how, even though my body was fatigued, it was not injured. It felt amazing to not be injured. As I got closer to the finish line I saw on the giant clocks that I was approaching 1 hour and 14 minutes. As I was in the second wave I knew that I needed to take 10 minutes off that time. I realised that I was going to complete this run well under my 1 hour and 10 minute goal. When I got to the end it felt so good to cross the line. 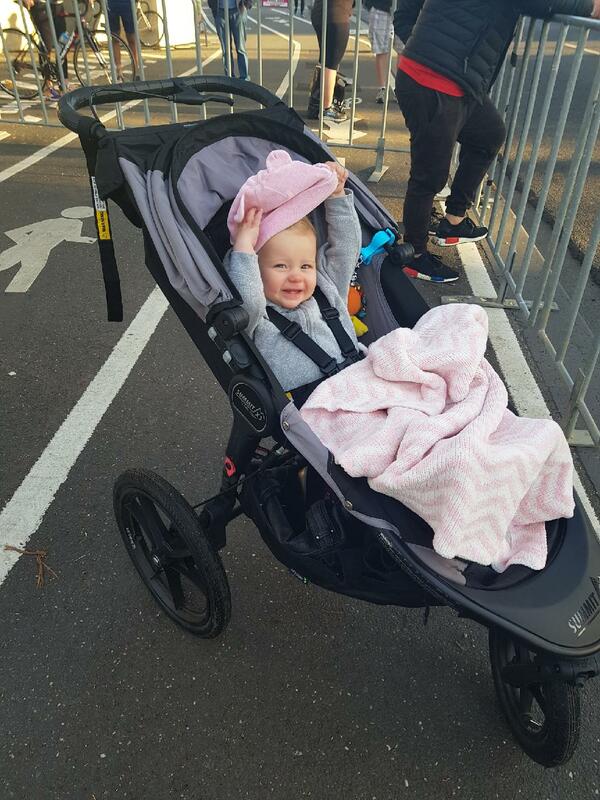 I was a little sad that B and Little K were not there to see me cross the line (security into the MCG is tight and it would have been impossible to navigate the complex with a pram). I walked up the steps to collect my medal, which I love. 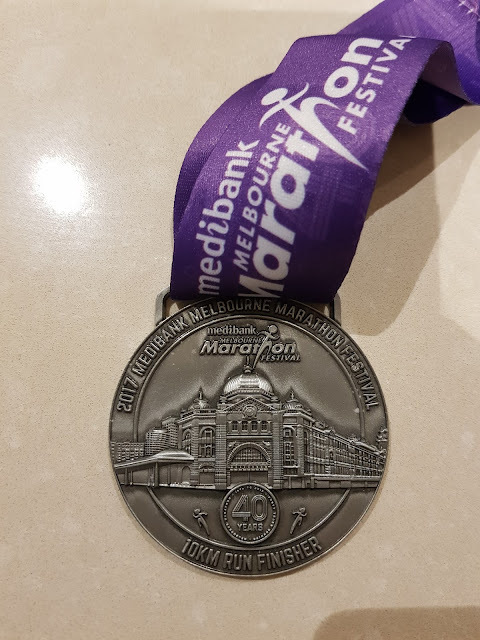 It has the iconic Flinders Street Station on the front, which we all got to run past during the event. When I made my way outside I found B and Little K. I gave Little K a huge hug. She really didn't understand what was going on, although she loved my medal. I'm hoping this is a sign for the future as I would love to have a little running buddy! In the end my time was 1:05:28. I was so happy. It has taken me what feels like a lifetime to get back to this position where I can do fun runs again. I am no longer injured. Give my post-pregnancy body some time and I will be back to running 10km in under 1 hour. Childbirth. When I was pregnant I decided that there was no point at all worrying about childbirth. It was inevitable. It had to happen. I had a baby stuck inside me and it had to come out. There was no point stressing about it as nothing could change that it was going to happen. I always had this feeling that my baby was going to be overdue. I knew that she was so comfortable inside me and that she had no intentions of coming out. My belly sat really high and a lot of women have the odd contraction in their third trimester, but not me. My child was happy where she was and I don't blame her - it was winter and my belly was much warmer then the world outside. 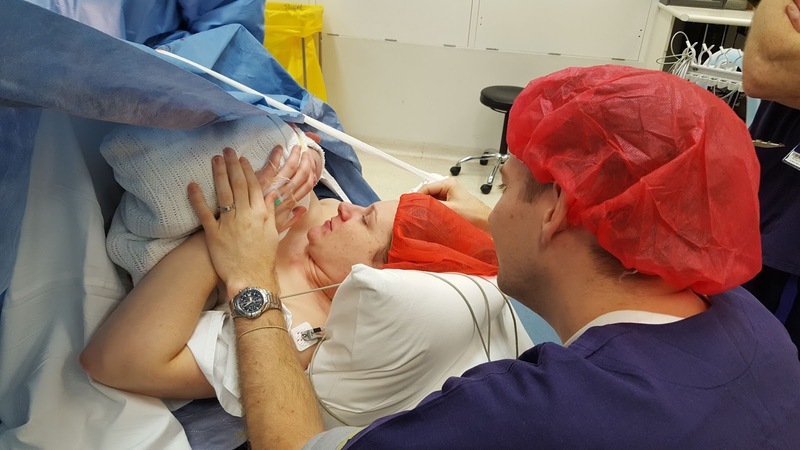 I could tell that my obstetrician was reluctant to perform c-sections as he hardly ever talked about them during my appointments, however when I got to 39 weeks we started to discuss them. My due date was July 21st. He told me that if I hadn't gone into labour by July 28th he would book me in for a induction on July 29th. I told him that was my birthday, so he decided to wait a few extra days as he told me that spending my birthday in labour would be the worst birthday present ever (and now I totally agree with him). Days went and past. Still nothing happened. On a Sunday night I was booked in for an induction. B and I went out for Thai for dinner - this was to be our last dinner by ourselves. We then drove to the hospital and my bump was monitored for 30 minutes to see if there were any contractions. And of course, nothing. My little baby was happy in her warm water world. She didn't want to come out. I was given a stretch and sweep, which where my obstetrician swept away the membranes from my cervix - ouch! I was then given some painkillers and sleeping tablets so that I could go home, have a good nights sleep and then return back to the hospital the next day. Funny thing was that I had no pain, no contractions and no sleep. I was nervous and could hardly sleep! At every little movement I was like "Is that a contraction?? ", which of course it wasn't. This kept me up all night. The next day we arrived at the hospital and I was monitored again to see if I was having any contractions. You guessed it. None. My obstetrician came in and decided to was time to get things started. A drip was put into my hand and I was given a synthetic oxytocin. Oxytocin is the hormone that starts labour and brings on contractions. My waters were then broken, which was disgusting, and it was time to start waiting. We didn't have to wait long. The thing about being induced is the synthetic oxytocin is that it makes your contractions go from 0 to 100 in about 10 minutes. I had read a book on birthing skills which uses drug free methods for pain-management, which I was going to incorporate into my labour. None of them worked. The pain was terrible, so I found it difficult to take my mind off it. It felt like my back and legs were on fire with each contraction. I also felt like I had no rest time between each contraction. It really was the hardest thing I had ever done. I remember asking for an epidural and the midwife telling me to try the gas instead. I knew that the gas wouldn't work, but I decided to go along with what she wanted. And I was right, the gas didn't work, so I asked for an epidural again. However, when the anaesthetist came along to give me my epidural things got a little crazy and I suddenly had this desire to push. I'd only been in labour for 3 hours but one of the midwifes told me to keep at it. Amongst all the drama the midwife checked my cervix and told me to stop pushing as I was only 5cm dilated, no where near the 10cm required to push a baby out. It was time for me to have my epidural. I had always freaked out about having an epidural as I was scared of having a needle in my back. I decided to keep sucking on the gas until I was in a happy place. B said that I had passed out, but I knew I was still awake. It allowed me to completely relax and stay still so that they could put the needle in my back. I have to say that an epidural is the best thing in the world. My terrible contractions disappeared and I felt fine. B and I watched the numbers on the machine next to my bed go up and down, telling me I was having a contraction, but I couldn't feel a thing. It was amazing! I did notice that my face felt itchy and when the midwife came back in I told her about it. She said it was a normal reaction to the epidural and not to scratch my face. Easier said than done. I couldn't ignore it and did spend a bit of time scratching my face. But it was way better than the pain. At about 1pm my obstetrician came in to check on me. My cervix was still at 5cm. He turned to me and said that we had a small issue. When a woman is in labour and having contractions the baby's heartbeat should be increasing either during or towards the end of the contraction. This shows that the baby understands that labour is occurring and that they will be coming out into the real world soon. My baby was not doing that. Her heart rate stayed the same, even after my obstetrician touched her head. She wasn't reacting to anything. He told me that he didn't think she would be coming out naturally. I remember looking at my obstetrician and saying "Does that mean I have to have a c-section?" I was nearly in tears. This labour hadn't turned out the way I had expected, not that I had any expectations, but to me it had been so crazy. 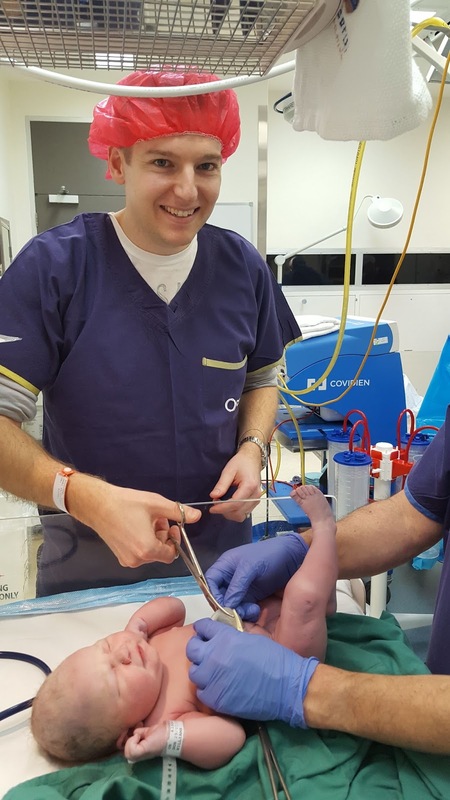 I was told I needed a c-section and my doctor and midwife started to organise what was to happen next. B was to be dressed in scrubs and a red hairnet was placed on my head. I was wheeled down to the operating theatre and we had to go through all the usual things. What was my name and date of birth? What was I allergic to - adhesive, hence the red hairnet. I was wheeled into the operating room by myself as they needed to prepare me before B was allowed to enter. The anaesthetist who did my epidural was also in the operating room and he chatted away to me whilst he administered some more drugs. He also gave me the best piece of advice ever. He told me that tomorrow I must make sure that I get out of bed when the nurses tell me to. I must make sure that I go for little walks around my room and stay 'active' as this would help me recover from my c-section. He said that women who stayed in bed all day and who didn't move tend to have a terrible recovery. I started to notice the drugs taking effect and that I couldn't feel my legs anymore. But then I noticed that I couldn't feel my arms. Well, I could slightly feel my right arm but my left arm was completely dead. I mentioned it to the anethisist but he said that was fine. Soon B came into the room and he sat down next to me. What I haven't mentioned is that B is terrible with blood. He has fainted twice giving blood and he fainted when he had to pick me up after getting my wisdom teeth out. We had joked so many times about he fainting during childbirth. I was now worried that it might really happen. I told him to make sure he sat down the entire time and that he didn't have to cut the umbilical cord. But he turned to me and said he was going to do it. I think he had had a change of heart due to me going through so much, the least he could do is cut the umbilical cord. Having a c-section is a strange experience. As I was numb I couldn't feel any pain but I could feel a tugging sensation. When my obstetrician opened me up he exclaimed that my baby was looking right at him and she wasn't in the position that she was supposed to be in. She was posterior, which meant that we were back to back - her spine sitting on mine. While it might sound nice, it is actually super painful, hence the awful contractions, and meant that she was facing the wrong direction in the birthing canal. The poor girl had gotten herself in a position that would have been impossible for her to be born naturally. After what felt like a lot of tugging she was out. We waited to hear her cries and finally they came. At 2:46pm, after 6.5 hours our little baby was finally born. I remember her being held over me and everyone telling me to touch her, but I was struggling as I could hardly move my arms. I also remember thinking about how odd her head looked and how... ugly she was. But because she had gotten herself stuck in the birthing canal, her head was out of shape, and thankfully after a few days she looked normal. B went off to do the things that dads do with newborn babies and I was left behind to be stitched back together. B and our little baby came back a little while later and I got to touch out baby again, with some help from B who had to hold my hand up so I could touch her as by then I had no feeling in both my arms. We were all then moved on to the recovery unit. We all spent 2 hours in the unit, which was a lot longer than normal. Since I couldn't move my arms the midwives had to help me feed her that all important colostrum that newborn babies need. We also had to wait until I had feeling back in my arms again, which took a really long time. I also started to get dizzy, so I was given some oxygen to help me breath a little better. 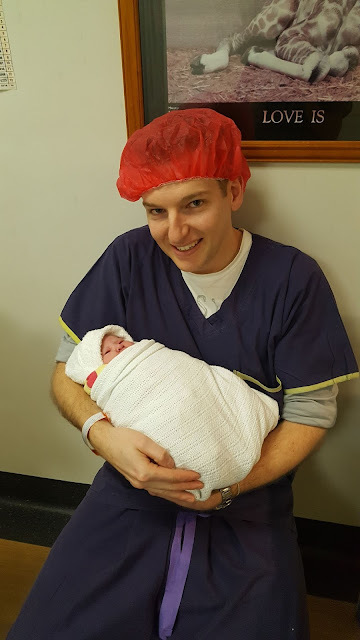 When the midwives were happy that the majority of the numbness in my body had subsided, we were finally able to go to our hospital room and begin our journey as a family of three. And it was also time to introduce Little K to the rest of our family! Getting back into running post pregnancy has been difficult. I wish that I could say that I was running throughout my entire pregnancy, even on the day I gave birth, and then the day after I gave birth to my daughter I was back out running the streets. My journey has been completely different. As previously mentioned, I had all day and all night morning sickness, followed by a virus and then cracked ribs. Thanks to this run of bad luck I was unable to exercise properly until I was 16 weeks pregnant and, consequently, I had lost a lot of cardio fitness. When you are pregnant you are not allowed to get your heart rate above a certain level as it can cause the baby distress. As I was so unfit it was so easy for me to reach that level, so most cardio became frustrating. Instead, I decided to do weights at the gym 3-4 days a week. Once I had given birth to Katelyn I was desperate to get back out there. Since I had had a cesarean I had to take my time. I started with some gentle walking around my neighbourhood and on the treadmill and I slowly increased my distance. At my 6 week check up my obstetrician gave me the all clear to resume exercise. I remember driving home, putting Katelyn straight to bed and jumping on the treadmill. I ran 1km and I have to say that it was bloody hard! My cardio fitness was pretty much at zero. 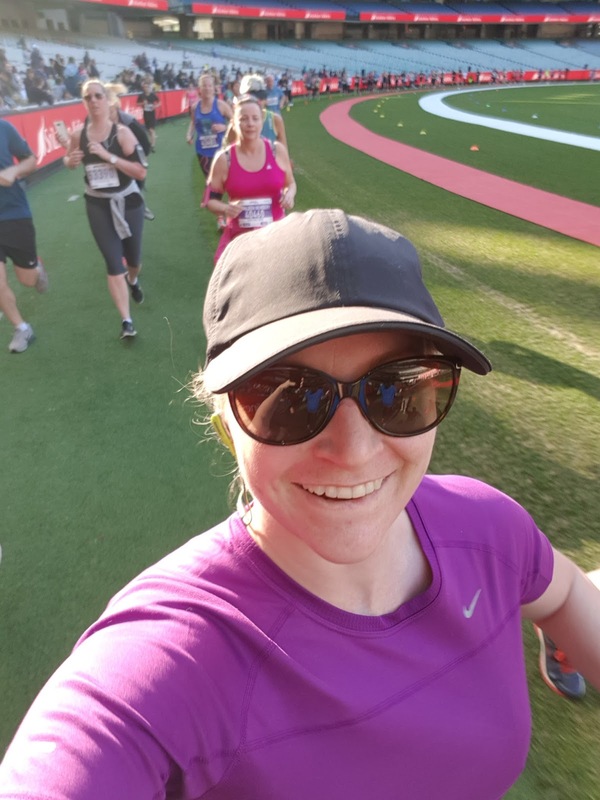 My body had changed whilst pregnant and running just felt different. It was like my hips were wider and my feet were landing on the ground all different. And finally, I could feel where my abdominal muscles had been cut open and stitched together. I had to remember that I had had serious abdominal surgery and it was really going to take some time to get back to normal. I wanted to get moving but I knew that I had to take it easy, so I decided to walk. And boy did I walk! I would get on my treadmill and walk. I would go outside and walk. Every now and then I would throw in a run. It wasn't too serious but I was moving. I did this for months, until Melbourne's summer disappeared and winter started to appear. It got cold, darker in the evenings and all I wanted to do was stay inside. Then, a couple of months ago, I had this desire to run again. I really started to miss it. I craved that runner's high! But the thought of running on the treadmill every day was so unappealing. I knew what I had to do. I needed a running pram. At that time I started part-time work again, so with my first pay cheque I went to Baby Bunting and put a Baby Jogger Summit X3 on layby. A month later I picked up my running pram. I was really nervous using my pram at first. I had read of other running bloggers who had injured themselves with a running pram. My body was feeling good and the last thing I wanted was another back injury. I read numerous articles on the internet about pram running form. I joined a pram running Facebook group and read every single question and answer that was posted. My first run with the pram was hard and the next day my body was sore as I had used so many muscles I didn't know existed, even in my upper body. But I keep persisting, the sore muscles went away and thankfully there were no injuries. My osteopath also advised me that running with a pram was probably the best thing I could do for my glutes, which have a tendancy to be lazy and switch off when I run, which then causes problems with my back. As time has gone on I have increased my amount of running throughout the week. My love for running had really returned. I couldn't stop thinking about running. It made me happy again. I also signed up for a fun run, which has really motivated me to continue running. But of course this journey is not over. My goal is to get myself back to running my previous times and distances. My name is Lady Lou! I'm a 30-something year old mum to the beautiful Little K and wife to B. This blog is about my fitness and life journey. At the moment I am trying to find my fitness again and remain injury free! I run and I do weights training, all while looking after my family and working.